Show your support of Sickle Cell Disease awareness with a wristband, keychain or T-Shirt. 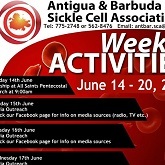 The Antigua and Barbuda Sickle Cell Association will be hosting its Week of Activities from Sunday 14th June - Saturday 20th June. Free testing available for high risk sickle cell individuals. SICKLE CELL CENTRE IS NOW OPEN! The Antigua and Barbuda Sickle Cell Association (ABSCA) officially opened its office on June 19 as a part of their World Sickle Cell Day and Sickle Cell Awareness week celebration.